I spent this past Saturday looking for meteorites along the California/Nevada state line with Richard, Roy, and Tom. It was a beautiful day with perfect weather and no wind. At about 11am I made the first find of the day. 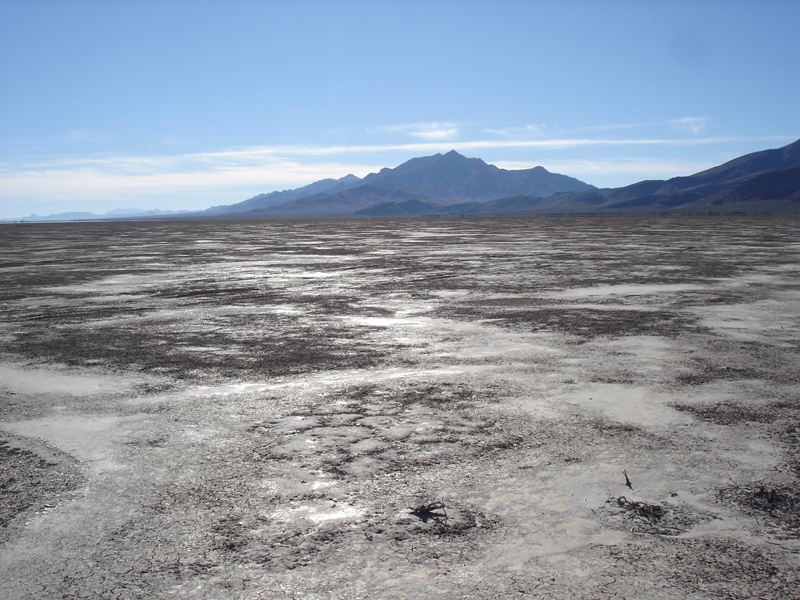 I saw the tip of a suspicious looking rock sticking up from beneath the dry lake surface. I popped it out of the ground and it came out as a large dirt clod, but I could pick the whole thing up with my magnet, good sign! 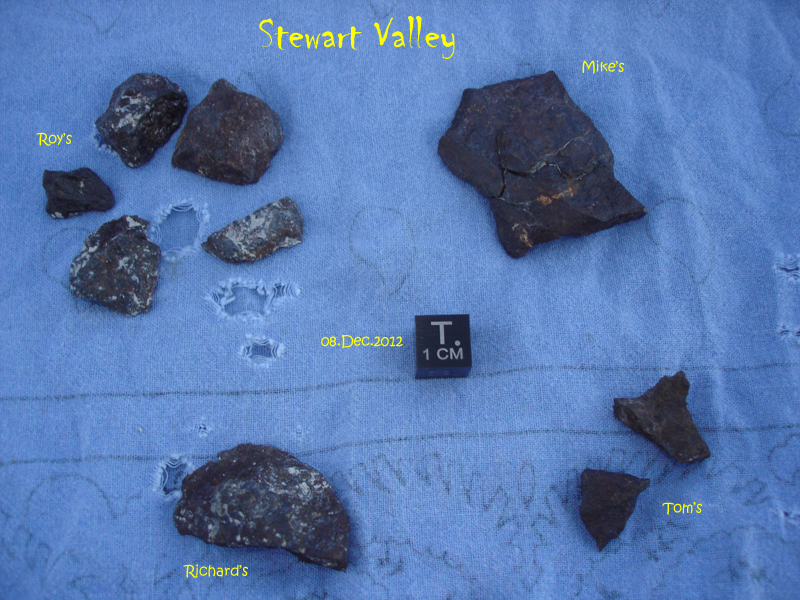 I wasn't really familiar with the Stewart Valley meteorites, but a quick look with my loupe and there was no doubt. 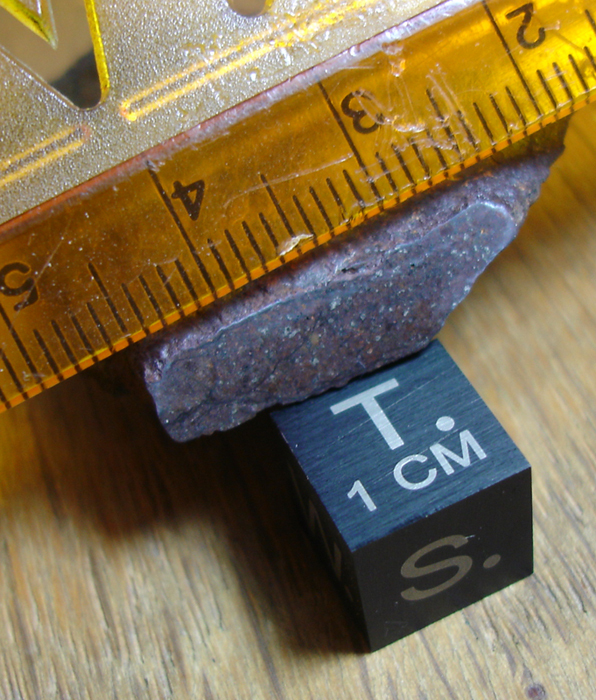 I cleaned the dirt off and put the meteorite on my scale: 19.5 grams. As I was documenting my find Roy made his first find of the day about 50' away from me. A short while later Richard called on the radio that he'd got one, too. We all hunted for another hour and then turned back to the Jeep for lunch. On the way back Tom scored a nice little meteorite fragment that Roy almost stepped on. 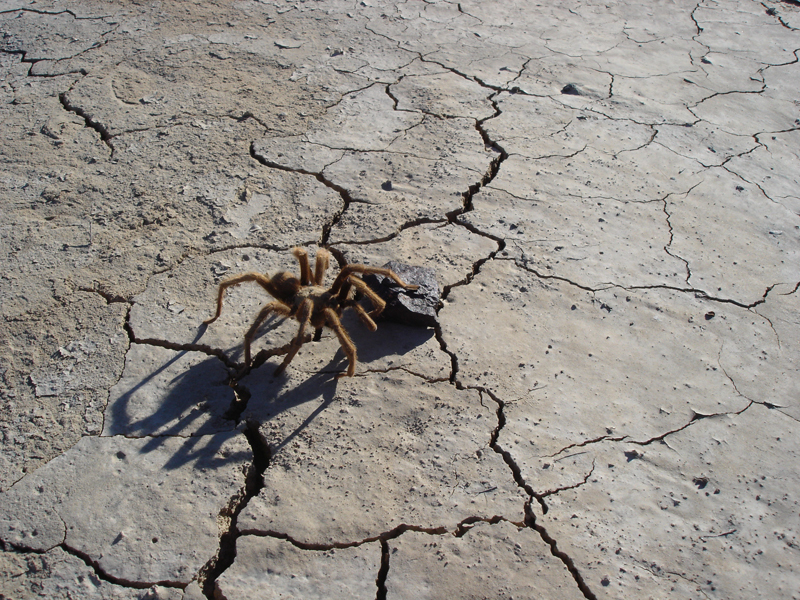 After lunch Richard called me over to see a tarantula. I tossed my meteorite in its path and it posed with my find. As the sun set behind the mountains all the shadows went with it and the visibility on the lake bed surface really improved. Roy made 3 more finds in the course of about 5 minutes! 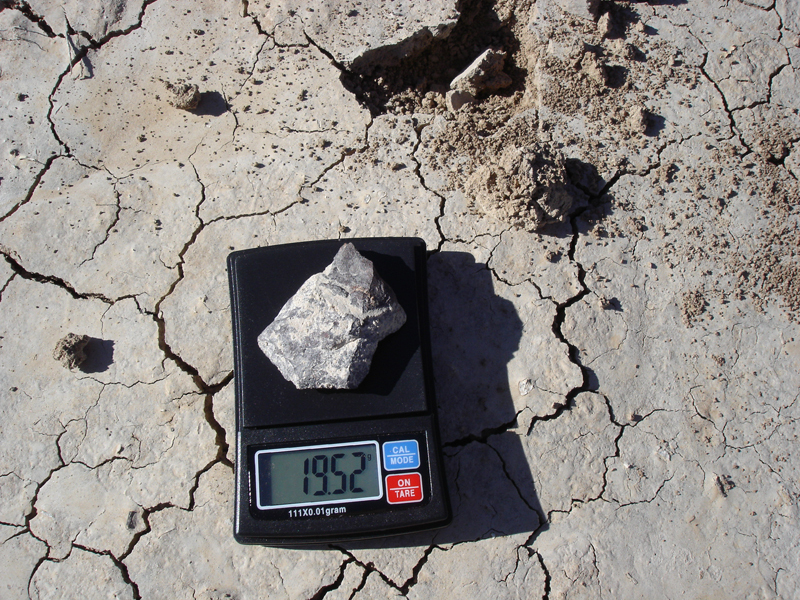 It was a great day looking for meteorites and we all managed to make finds, you can't ask for more than that. Here's my Stewart Valley meteorite find. I thought it might be an L-chondrite based on how it attracts to my magnet, but hunters intimately familiar with the area have told me it is more than likely an H-chondrite. I sanded a window to see the inside of the meteorite. The iron-nickel flecks are very evident in the dark, weathered matrix (W2 or W3 maybe?). Only one partial chondrule is visible is the upper left corner of the window, surrounded by veining; it measures 2mm across. 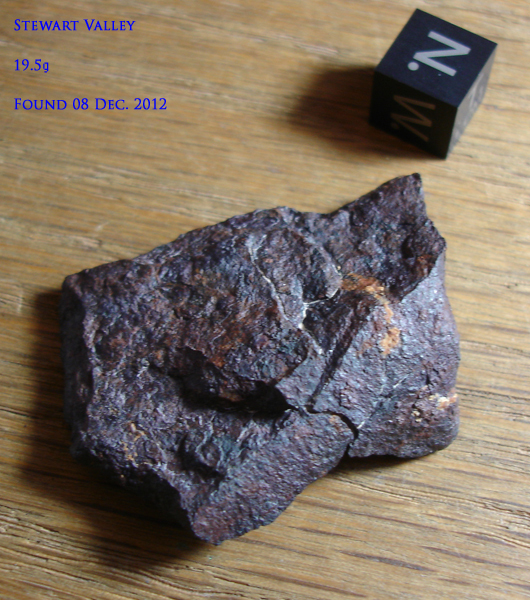 Like most of the meteorites found at Stewart Valley this one is probably a type 6.